Kovind launched the Rs 636-crore 'Mukhyamantri Health Insurance Scheme' under which 57 lakh of the 68 lakh families in the state will benefit. 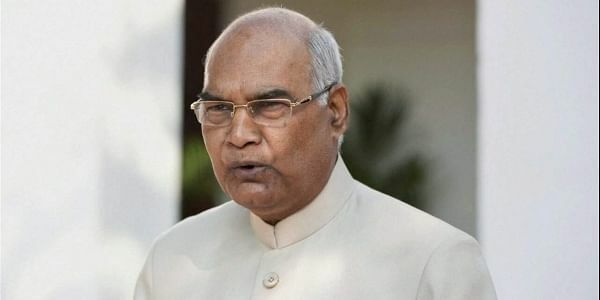 RANCHI: President Ram Nath Kovind on Wednesday launched, or laid the foundation stones of, various schemes entailing total expenditure of Rs 3,455 crore in Jharkhand to coincide with the state's 17th Foundation Day. Kovind launched the Rs 636-crore 'Mukhyamantri Health Insurance Scheme' under which 57 lakh of the 68 lakh families in the state will benefit. Beneficiaries will get treatment costing Rs 2 lakh under the scheme. The President also kicked off the Rs 290-crore '108 Ambulance' service in the state. Kovind launched JOHAR (Jharkhand's Opportunities for Harnessing Rural Development) schemes entailing expenditure of Rs 1,500 crore to help tribal and Dalit families double their incomes in four years. He also laid the foundation stones of two flyovers at Harmu and Kantatoli, which will cost Rs 490 crore. Earlier, Kovind arrived in Ranchi on Wednesday morning and paid tributes to freedom fighter Birsa Munda at the Birsa Chowk. The President had also tweeted tributes to Birsa Munda on his 142nd birth anniversary. "Tributes to freedom fighter and national hero 'Dharti Aba' Birsa Munda... I am happy to be visiting Jharkhand on this day," the President had tweeted. Jharkhand was created on November 15, the birthday of Birsa Munda who fought against the British. Speaking after the launching of various schemes, the President said: "I am happy that Jharkhand is progressing as per its potential. Jharkhand has jumped to the top from bottom in ease of doing business." He recalled the sacrifice of freedom fighters from the present-day Jharkhand, including Birsa Munda, Sidhu Murmu, Kanhu Murmu, and others. Chief Minister Raghubar Das said the state's people will be forever indebted to then Prime Minister Atal Bihari Vajpayee who understood their feelings and created Jharkhand. He said the Bharatiya Janata Party government in the state gave equal rights to people of every religion and the Religious Independence Act was one step in that direction. "Now no one can convert anyone through allurement. We may be poor, but our religion is not for sale." He said he appealed to people not to fall prey to Maoists, adding that those gone astray should surrender or else strict action would be taken against them. Jharkhand Governor Draupadi Murmu also congratulated the state's people on the Foundation Day. The main event was held at Morabadi ground in Ranchi, and was attended by central Ministers of State Jayant Sinha and Sudarshan Bhagat. Both are Lok Sabha members from Jharkhand.